I was warned it would happen. The other mothers, the ones with older children, would look at me wistfully with a hint of pity in their eyes. Now, looking back, I realize that I was a skeptic. Perhaps I was naive. Perhaps I was just hopeful it wouldn’t happen to me. Either way, I was wrong. Dead wrong. And now, I find myself realizing the truth. The truth about the ‘hollow leg’ stage. You see, I have a 12 year old boy in my home who is always hungry. Always. Keeping the fridge and pantry stocked with healthy options has practically become a part-time job for this mama. The struggle is real people. And there is nothing my boy loves more than homemade baked goods. So you can imagine how thrilled he was when he walked into the kitchen one day and saw a cake stand piled high with gorgeous blackberry scones. His eyes were big as saucers as he asked if he could have one of those beautiful, still warm out of the oven, goodies. But as his hand reached out to select the largest one, he spotted it. Something green. In the scone. “WHAT is that?” He cried. “Well, son, that is basil.” I replied. “Why did you put basil in the scones?” He asked. 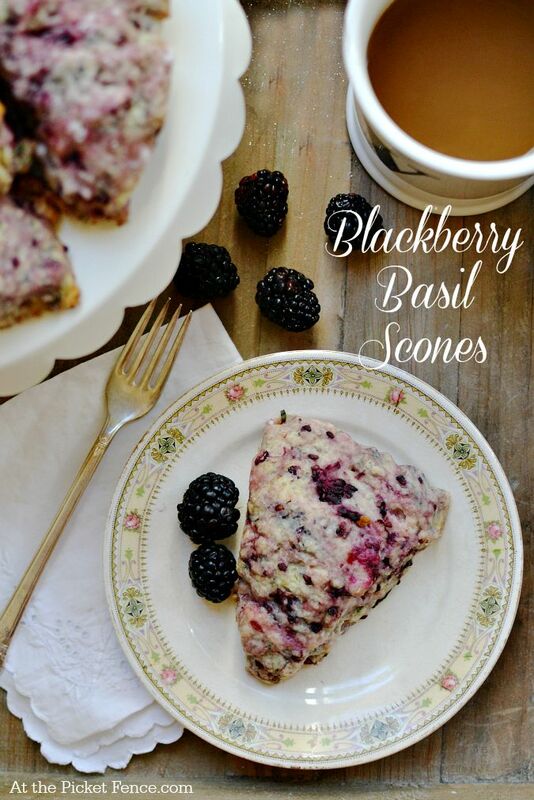 “Because I tried a basil scone at that cool, hip new coffee shop downtown and I thought it added great flavor so I wanted to try it at home.” I said. “Ummmm…well…I guess since I touched this one I should go ahead and try it.” He replied. And he did. He tried it. He tried that one. Only that one. Maybe I should have made some without basil. Maybe I should have felt badly that he didn’t really like them. Maybe I should have made something that I knew the whole family would enjoy. But, for the love of all that is good and tasty, sometimes enough is enough. We moms in the hollow leg stage have needs too! We need to know that we can bake something and not have it disappear in the blink of an eye. We need to know that when the kids are finally asleep and the house is quiet and our sweet tooth starts aching that the treats we baked earlier in the day will be there when we reach for them. So, my fellow moms in the hollow leg stage, I say to you that we must unite. We must stand together in solidarity. While we keep those refrigerators and pantries stocked, we must not ignore our own needs. In a bowl combine the flour, sugar, baking powder, salt and cinnamon. Cut in cold butter until mixture resembles coarse crumbs. In another bowl whisk together eggs, 3/4 cup of the milk and vanilla. Add to dry ingredients combining just until moistened. 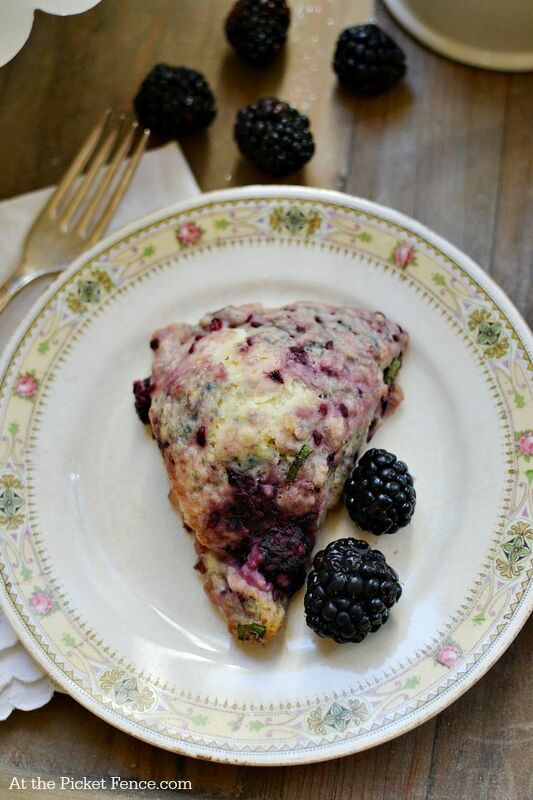 Place mixture on floured surface and then gently fold in the blackberries and basil. Divide the dough in half. Pat down each portion into an appx. 8 inch circle then cut into wedges. Place on greased baking sheet and brush with remaining 2 tablespoons of milk. To make the lemon glaze combine powdered sugar with lemon juice and stir until it reaches the desired consistency. Allow scones to cool completely before drizzling on the glaze. 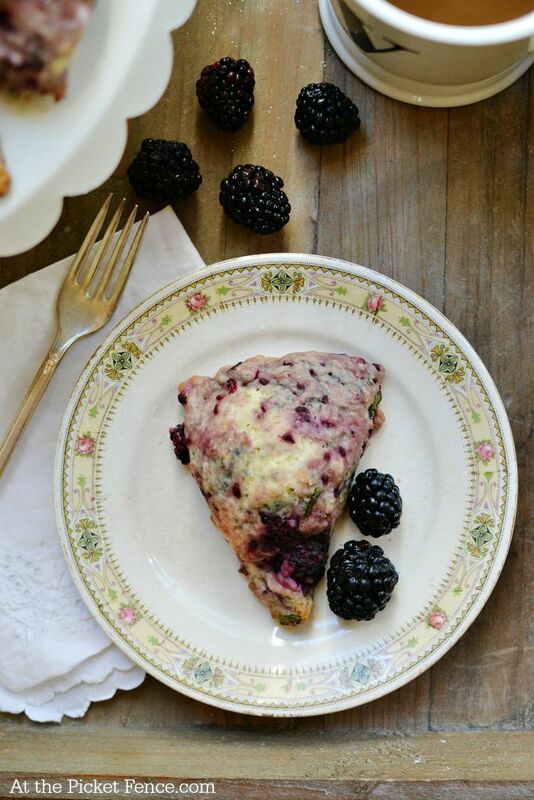 9 Comments on "Blackberry Basil Scones With Lemon Glaze"
LOL! Good one! Fixed his lil red wagon! Venessa, My hollow legged boys are now 42 and 44. They will love these. Me, too! I love your beautiful pictures of lovely china and linens. Your blog is a great way to begin the day! Thank you! Amen Sister ! I raised 3 boys and 1 girl. My oh my our grocery bill was big ! I did teach every one to cook and one son is now a chef. He cooks for me now. Thank you Lord ! Amen! Amen! Amen! I have 3 teenagers (13,16,17) in my home right now and my grocery bill is pure insanity. Fortunately, two of my teens are girls – but they all seem to go through the hollow-leg phase. Now, I am going to try your recipe so I can have something to eat!!! These scones look and sound so delicious! I absolutely love basil. I even put it in my water and add some lemon! I had a one night “stay-cation” with my sisters at my house last weekend and made these Saturday morning. Yum, yum! Easy and delicious and I actually forgot the icing. I will make and share these scones again.